Every morning, Ditan Park in Beijing transforms into a microcosm of Chinese culture. Each morning amid the bustle of urban Beijing, a park historically reserved for the emperor transforms into a microcosm central to the understanding of Chinese culture. "Parks are a bit different here," said Tianran He, TV host and Chinese culture aficionado. "You don't get peace and quiet; you get a frenzy of activity." Ditan Park, home to the Temple of Earth, is packed with people on a Saturday morning — a stark contrast to its almost divine history. "The emperor would have come here during the summer solstice to pray for good harvest, good weather, good fortune — you know, peaceful kingdom," He said. "All of these big important places would have been off-limits to normal people." "It was the emperor's duty to attend these sacrificial ceremonies because he had the mandate of heaven," He said. "He was essentially the, you know, the only person who could talk to heaven." 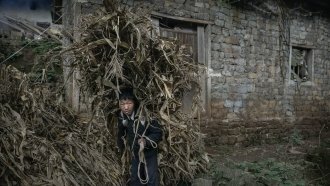 Related Story Can China End Rural Poverty By 2020? But now the park hosts singing and dancing groups, teams of hacky sack players, tai chi enthusiasts and calligraphers — all in one place. "Chinese people like doing everything in groups," He said. "I think that's actually what — one of the coolest things about China because you're not going to be alone when you're old. You're not going to be at home reading by yourself. You're going to be out here doing tai chi or dancing with a big group of people. It's very — it's good for not getting dementia." This display of China's culture is an all-day affair. "Usually what happens is people have breakfast, they come out to exercise or sing or walk their birds, and then they go home around 10:30, 11:00 a.m. for lunch," He said. "If they're cooking, they'll come back a little bit earlier, and they'll nap for a bit, maybe until about 1, 2. Then come back out again to exercise, walk around and go back home again at 4:30, 5 p.m."
"Meals are very important in China; you don't change the timing of your meals," He said. "It's all about one set schedule, and you work your life around your meals." In the meantime, people get a day full of artful socializing, escape and zen — right in the middle of Beijing's urban hum.